PUEBLO - The Music Department at Colorado State University-Pueblo will perform a Feb. 20 concert to benefit one of its own, Charles Ortega, who is hospitalized and in a coma following a tragic car accident. Various CSU-Pueblo faculty and student ensembles will perform at 7 p.m. on Feb. 20 in Hoag Recital Hall. Donations will be taken at the door for Ortega who remains in Penrose Hospital recovering from injuries sustained in an accident in Colorado Springs on January 18. An adjunct professor of tuba and euphonium at CSU-Pueblo since last fall, Ortega is the principal tubist with the "Inside the Orchestra" ensemble in Denver, the Fort Collins Symphony, the Steamboat Springs Orchestra, and the Colorado Springs Philharmonic. He is the tubist for the Apollo Chamber Brass, a professional brass quintet in the Denver area, and the tubist with the Best Brass ensemble in Durango, CO. He teaches lessons, coaches the low brass ensemble, and performs in the faculty quintet. Previously, he served as adjunct faculty at the University of Wyoming-Laramie. 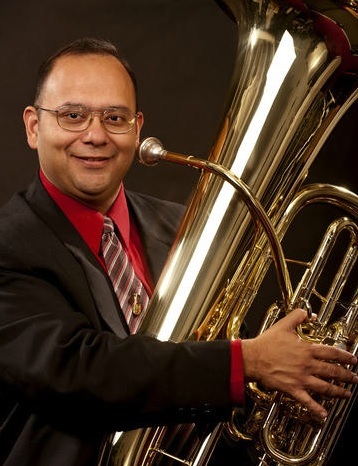 Born in the Rio Grande Valley of McAllen, Tex., Ortega received his Bachelor of Music in Tuba Performance from the University of North Texas in 2000, studying with Don Little, principal tuba (retired) with the Fort Worth Symphony Orchestra. Between his undergraduate and graduate work, Charles was principal tuba with the Disney Grammy Collegiate Orchestra for the 1998 season at Walt Disney World in Orlando, Fla. He received his Master of Music degree from the University of Wisconsin-Milwaukee, studying with Alan Baer, principal tuba with the New York Philharmonic. In the area of instruction, Ortega has been on the faculty of some of the top schools in Colorado, including Arapahoe High School, Mountain Range High School, Loveland High School, and Legend High School & Legacy High School. He has had an active teaching studio in the Denver area of Colorado and has been expanding his studio to include the Colorado Springs area. He splits his time between Frederick and Woodland Park, both in Colorado. He enjoys Mexican Food, Ballroom Dancing & spending time with his fiancée, Amy, her two daughters Brianna and Kyra, and his son, Aaron.